Deena Kastor was a star youth runner with tremendous promise, yet her career almost ended after college, when her competitive method - run as hard as possible, for fear of losing - fostered a frustration and negativity and brought her to the brink of burnout. On the verge of quitting, she took a chance and moved to the high altitudes of Alamosa, Colorado, where legendary coach Joe Vigil had started the first professional distance-running team. There she encountered the idea that would transform her running career: the notion that changing her thinking - shaping her mind to be more encouraging, kind, and resilient - could make her faster than she’d ever imagined possible. Building a mind so strong would take years of effort and discipline, but it would propel Kastor to the pinnacle of running - to American records in every distance from the 5K to the marathon - and to the accomplishment of earning America’s first Olympic medal in the marathon in 20 years. Let Your Mind Run is a fascinating, intimate look inside the mind of an elite athlete, a remarkable story of achievement, and an insightful primer on how the small steps of cultivating positivity can give anyone a competitive edge. author describes her journey as an American runner over years. With long distance running dominated by girls from Kenya/Ethiopia hee achievement speaks for itself. Through this book you will learn hee journey toward winning Olympics medal and marathon. The book ends with her running career. While author has narrates hee running story it falls short of being an engaging story. I would have liked this to be more engaging. If you ever seen Deena Kastor, she seems to smile A LOT. After reading the book, I now know that the smile reflects her way of thinking. I am not a positive thinking person. Sometimes I get put off by people who are overly positive. But that says more about me than it does about them. The thing I discovered in this book is that I could be positive, too. In my running. In the way I interact with people. In the way I live my life. I’m kind of an old fart, but I’m also willing to try new things that will make my life hopefully more enjoyable. This is a very enjoyable book, even if you don’t run. I would highly recommend it. Thanks, Ms. Kastor. Great job! I've always admired Deena Kastor. Afer reading this book i admire her even more!!! I loved reading her story, hearing her perspective on racing. She has amazing mental strength and was able to reach her peak performance by changing the way she talked to herself and the way she reacted to negativity. She's a total badass!! I'm so inspired.I cant wait to incorporate her methods into my training. this book will make you want to go for a long run, it'll make you want to push yourself to the next level. Thank you Deena!!! Absolutely excellent book. Such a great story and great lessons for sport and for life. Really enjoyable!! Very inspiring! 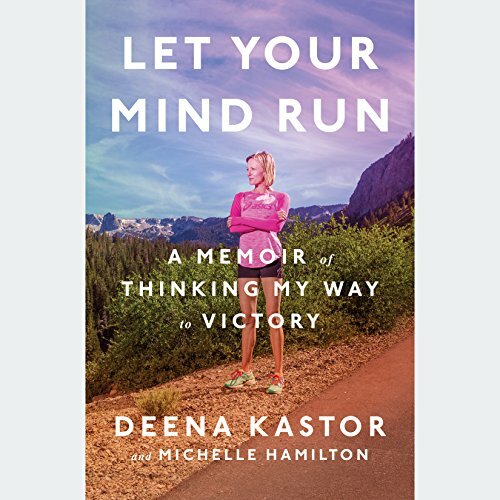 Would you try another book from Deena Kastor and Michelle Hamilton and/or Deena Kastor? Not really. The book focused too much on Kastor's career, with many details that did not enhance the overall point of mental traning. Which character – as performed by Deena Kastor – was your favorite? There is really only one character in this book. Do you think Let Your Mind Run needs a follow-up book? Why or why not? What a fine inspirational book! This book spoke not just about running but about life. The joy that Deena encouraged in herself was so empowering for me. Thanks for sharing. inspirational and definitely worth reading again. very pleasant narration, hard to put down. found myself listening to it completely over a two day period. A look into the life of an elite runner. Great insight into the mind of a champion! Deena does a fantastic job describing how she found running, and climbed up the ranks as a young high school athlete, through college and into training with Joe Vigil and her team at altitude in CO & CA! The best part is all the little mindset nuggets that Deena shares as she was preparing for races and during races. I have taken away a lot of positive reminders that I can use in my every day life. I read about one running book per month. I seem to never get enough of it. as a recreational runner myself aspiring to become an ultrarunner I constantly seek gems of wisdom about running. running, it appears has a lot more to do with philosophy and the mind than it is with the body. and so off course I was intrigued by the books title. the book didn't dissapoint at all. Deena told her story in magnificent transparency. coach vigil who I respect very much for his life's work and ideaology is metioned throughout. i listened to large parts of the book while running myself and found myself inspired and smiling quite a bit. highly recommended to anyone curious about this simple yet profound activity. and more so to anyone seeking an Olympics medalist view of the lows and highs of training. This is my favorite running book. One of my favorite books of any genre! Deena’s perspective is life changing and powerful. So grateful I listened. I was expecting more information on visualization and mind body connection, etc. It is truly just a memoir. Don't purchase unless you are a strong fan of her already. I knew of Deena Castor as an elite marathon runner but not the life detail or her performances and records. What drew me to this book was the promise of mind over matter. Using your mind as a powerful tool to improve self and improve running performance. It is a great book with huge insight into every detail of Deena's high school running days, her rise to fame and amazing performances at the highest level. The detail in the race accounts is stunning. I loved every gripping recollection of her racing days. So much to learn and admire from one of the greats of Marathon running. A definite recommendation for anyone looking to be inspired and motivated to train harder, wiser and reach your goals. this having priorities, focus and appreciation will create that positivity we all strive for particularly when running. I love how Deena portrays without evening realising how keeping a focused life concentrating on a few passions really brings out the best in all of us and leads to a more satisfying life. Keep it simple and look within as to what’s really important in your life. Good if you are in the mood for something positive and easy to listen to. Such an enjoyable listen and very helpful to us amateurs who love a nice run. This book is uplifting and helpful. The stories of courage are so well executed. Philosophies here apply to life ... not just running. Loved it. Will listen to it again. Loved it. The way Deena tells her story from start to finish it helps see the psychological development she went through over her years as an elite athlete. Her attitudes and the advice given to her are applicable to anyone, even if you aren't running.